High reps of body-weight squats will work muscular endurance. Most women want that nice, lean lower body that looks great in shorts or dresses. Squats are an exercise that trains multiple muscle groups in the legs for increased muscle tone. However, the question often is: how many reps should you do? High repetition of body-weight squats will train your leg muscles for endurance and burn some calories, but it may not give you the results you're looking for. These are a great exercise because you can do them anywhere without any equipment and hit the major muscles in your lower body. Start by standing with your feet about shoulder width apart, toes pointing straight ahead. Bring your arms up to shoulder height straight out in front of you for balance. Bend at the hip and knee, leaning your torso forward slightly as you lower. Keep your heels on the ground and lower until your thighs are parallel to the floor. Press through your heels back to the standing position for one complete repetition. High-repetition training is often anything over 15 repetitions and can be up to 50 or more. When doing high-rep training the load, or weight, is lower so that you can keep going. Body weight usually falls into this category because it is what you carry around every day. This type of training is good for increasing muscular endurance. Endurance is defined as your muscle's ability to continue to perform for successive exertions or many repetitions, according to the American College of Sports Medicine. It is moderate intensity and will not really add muscle to your body. If you are new to exercise, then a body-weight squat may be pretty challenging at first. You may not even get to 15 reps, let alone 50. But you will quickly get used to squats with just your own weight. Adding resistance increases your intensity, burns more calories during a session and adds muscle to increase strength and metabolism. If you continually perform your squats the same way your body will stop changing. Add a little resistance by holding dumbbells or a medicine ball to increase the challenge and force your muscles to work harder. Before choosing the amount of reps and if you use any extra resistance you need to have a goal. If you are trying to lose weight and increase muscle tone in your legs, then add resistance and perform eight to 12 squats. If you want muscular endurance for a sport or you just like to train that way, just use your body weight and do a lot of squats. 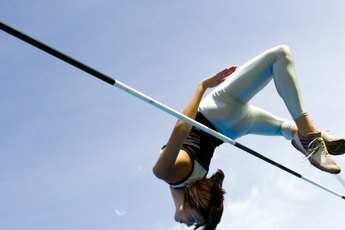 No matter what you choose always focus on proper form and technique to avoid injury.